While they didn’t manufacture rocket-powered roller skates or jet-propelled unicycles, if Wile E. Coyote needed a stapler he knew exactly where to go and what to get. Of course, we’re talking about one of the best-selling offerings from the Acme Staple Company, the Sure Shot stapler. 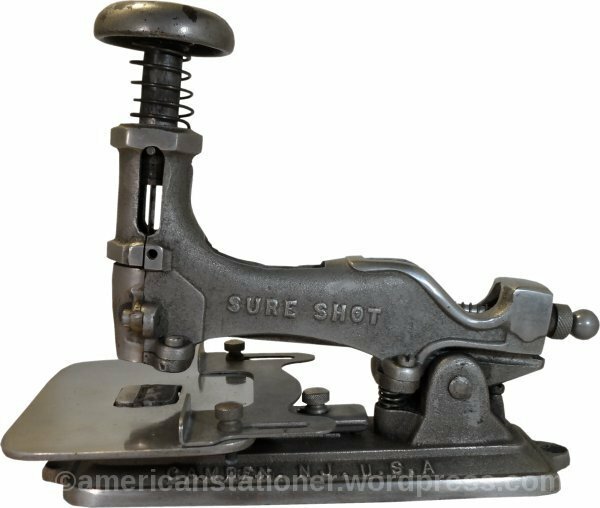 The Sure Shot was the first stapler offered under the Acme name. William J. 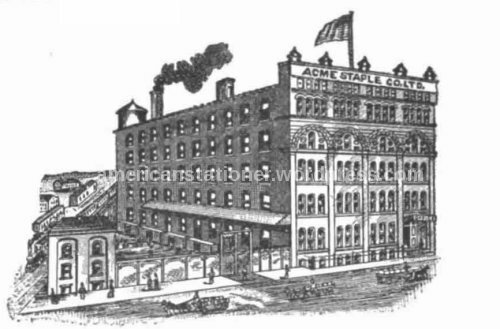 Brown founded the Acme Staple Company in 1894. 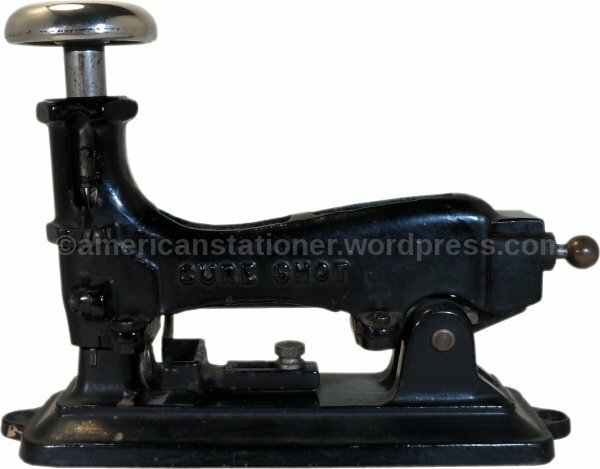 However, prior to that year he had released other staplers that were distributed for him by S.J. Yarger of Philadelphia. William Brown was a pioneer of early office technology. The Sure Shot was released in 1894 and was sold as late as 1941 and likely even later. 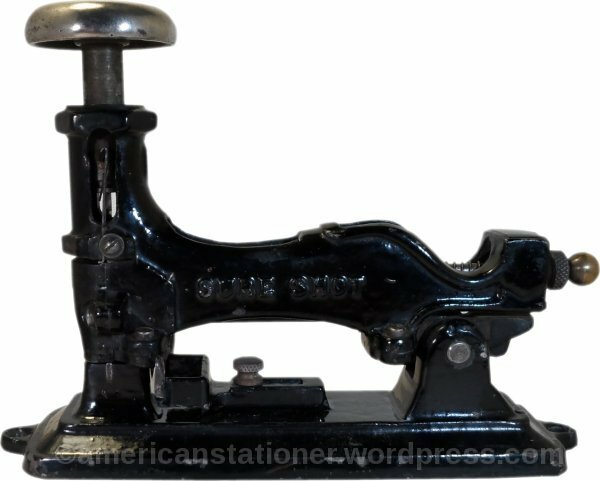 The initial patent, 532136, was applied for on January 25, 1894 and granted on January 8, 1895 to William J. Brown. An improvement to the staple driver was made soon afterwards and patent 552254 was granted on December 31, 1895. This patent was applied for on July 3, 1895 and was granted to Elwood Michener and Winfield Ashbey and then assigned to the Acme Staple Co of Philadelphia. It can be difficult to date a Sure Shot especially as they were manufactured for such a long time. Of course, if you see “Camden, NJ” stamped on the base you can date your item to a 50 year period of between 1909 and 1959. However, the lack of place stamp on the base or elsewhere does not necessarily mean it was made in Philadelphia. Another way to date your item is if you have the original packaging. 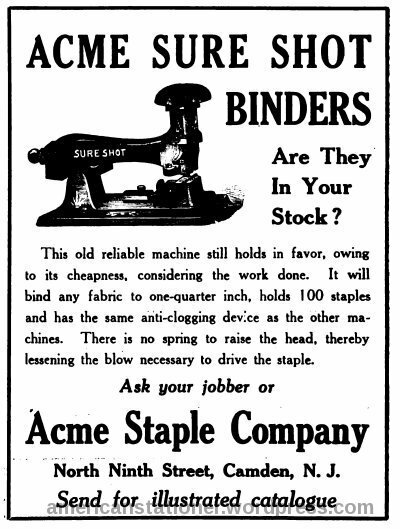 Starting around 1934 Acme started using the “StapleCraft” trademark. 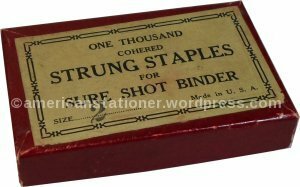 If the original box has the StapleCraft logo you can date your stapler to 1934 or after. The photo above matches exactly with the original patent illustrations. However, there were two basic designs that were available. These two designs differed mainly in body style. The original had a smooth, convex back while a later design had a concave portion towards the rear. The patent illustration and all of the early advertisements show the convex design. The concave design was 10% lighter than the convex. Since the Sure Shot was a long-time seller, as the design got older and competition grew it seems reasonable to think that the profit-margins for this item would decrease over time. Due to the older design and more updated fastener technology available to the buying public it is unlikely that they could raise the price to keep up profits. One way to make this item more cost effective to produce would be to reduce the amount of materials (specifically iron) that would be needed, thus increasing their profit without raising prices. The Sure Shot was available in two finishes; a black japanned finish and a nickel finish. The nickel finish was more expensive. Also, for most of its run the Sure Shot did not have a plunger return spring. Ostensibly this was to make it so less force was needed when depressing the plunger. However, some Sure Shots did have a plunger return spring. It is my opinion, that like the nickel finish, you could get the option of plunger return spring for an additional cost. Also note that other add-ons were available like the staple anvil platform shown in the picture near the end of this post. 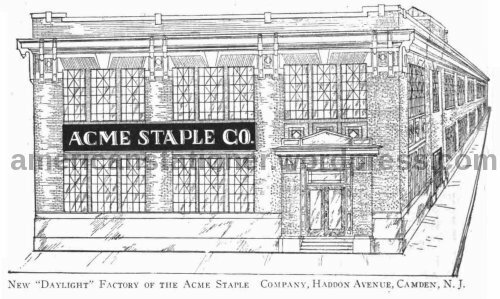 The Acme Staple Company, Limited, was founded in 1894. The original location was 500 North 12th Street Philadelphia, PA. They were at this location from 1894 until May 1909. 2007 photo of 500 North 12th Street in Philadelphia. I’m unsure if this is the same building that originally housed Acme or if this was built later. Photo from Google Maps. They then moved to 112 North 9th Street Camden, NJ on May 17, 1909 and were at this location until 1914. They then moved to 1643-1647 Haddon Avenue, Camden, NJ and were there from 1915 to 1959. The original factory was approximately 15,000 square feet. An interesting side note; in 1919 Acme purchased Allen & Co of Philadelphia. Allen & Co was located in the old S.J. 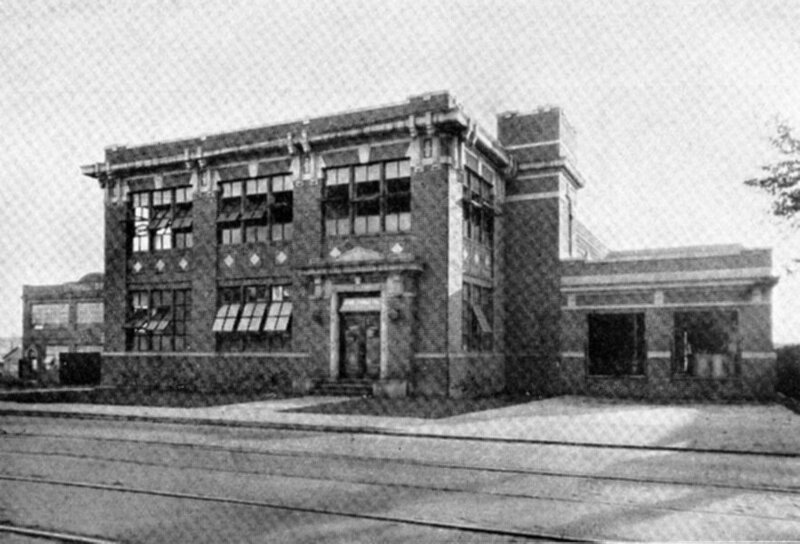 Yarger plant in Philadelphia and was a manufacturer of staple-binders. note the addition to the right side of the building in the two pictures above. Planning for this addition started in 1919 and was in place by 1930. The above photos are from http://www.dvrbs.com. 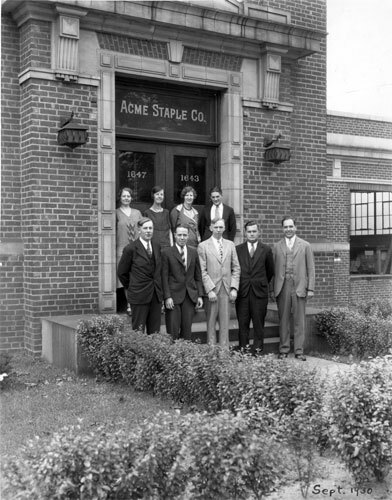 Acme Staple Co is still in business today and is located at 87 Hill Road, Franklin, NH. They’ve been at this location since 1959.
example of Sure Shot with concave back, nickel finish, plunger return spring and special anvil stapling platform. Note the additional stamping of “Camden, NJ, U.S.A.” on the base dating this sometime between 1909 and 1959.